A full-length story ballet needs to be watched with at least a slight suspension of disbelief. After all, only in fairy tales will a prince fall in love with a swan, or a jilted fiancée save her lover from ghosts. And although the ballet Raymonda lacks supernatural creatures, the entire production is an exercise in suspense, with a threadbare libretto that becomes a celebration of the beauty of dance and the elegance of restraint. 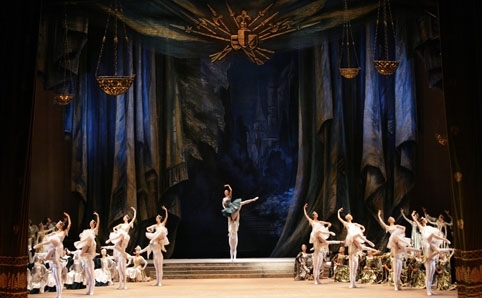 The Bolshoi Ballet’s June 2012 performance of Raymonda, which Sharmill Films produced for international broadcast, renders the story impressively. Over 2 hours, Yuri Grigorovich’s adaptation of Marius Petipa’s choreography tells a simple love story that moves briskly, showcases its dancers, and reminds the audience of ballet’s ability to create an all-encompassing world. Raymonda is much like a medieval tapestry: easy to admire from afar, but richer and more absorbing in close viewing. The SIFFFilmCenterhosted a small, rather reserved group for its August 6, 2012 screening. The exquisite, unobtrusive filmmaking helped maintain a certain inclusivity with the original Russian audience, but several sound blips in the recording were a constant reminder that this quiet Seattlebunch was far removed from the enthusiastic full house present at the taping. In fact, most of Raymonda’sfireworks came from the technical dancing, rather than the plot. Act I takes place in the court of Countess Sybil de Daurice, the aunt of young beauty Raymonda. Raymonda must bid farewell to her fiancée, a milquetoast lad named Jean de Brienne who will fight in the Crusades and, presumably, return to marry her. While he is gone, she has a dream that they are happily reunited in a garden. Act II opens with yet another set of festivities, when the nobles are suddenly joined by a group of Saracens and their leader, the preening Abderakhman. He brazenly tries to entice Raymonda off to his kingdom, but de Brienne returns with a group of knights to fight a duel for Raymonda’s hand. All of Act III is then a triumphant wedding party for Raymonda and de Brienne, filled with superb character dancing and classical variations. As Raymonda, Maria Alexandrova displayed the fleetest pointe work imaginable, along with a dynamic understanding of her character’s motivations. With her facial expressions, she crafted Raymonda into a compassionate noblewoman who grew in both courage and subtlety as she endured love’s trials. Though Alexandrova seemed to disdain fully closing any of her fifth positions in allegro work, her overall consistency was apparent in a graceful series of hitch kicks and silky, adagio développés. Ruslan Skvortsov, partnering her as de Brienne, was capable enough in his technical presence, but even his airy jumps and grounded partnering couldn’t make up for the hesitation he presented in his Act I variation. A dutiful knight, he was not necessarily an attentive one. Far more interesting was Pavel Dmitrichenko as Abderakhman, who provided a welcome spice to every scene, especially with his acrobatic choreography. Though Abderakhman is an evil foil to de Brienne’s piety, Dmitrichenko danced the role with a maniacal sort of bumbling sincerity. It was a pity there was no Saracen princess for him. The Bolshoi also showed a particularly deep field of soloists and corps members. As Raymonda’s friends, Anna Nikulina and Yekaterina Shipulina had freedom of extension that matched Alexander Glazunov’s wonderfully sweeping music; their freshness was echoed in later variations where Chinara Alizade and Anna Tikhomirova skimmed across the stage with radiant smiles and hummingbird-quick bourrées. Also of note were Yulia Lunkina and Denis Medvedev as the Saracenic Dance couple at the wedding. Their arresting chemistry carried them through a stately dance of whirling chassés. Frustratingly, the choreography often relegated the corps de ballet to the role of living scenery, even though several plummy sections showed that all of its dancers were more than capable of achieving virtuosity in both jumps and turns. Quite often they almost blended into Simon Virsaladze’s grandiose, desert-hued set, except for during the dream sequence in the garden, where the women’s shimmering tutus swayed in an intricate formation. But at the heart of it, the ballet was really about tradition, celebration, and classical variations. From the pageantry of the crusader knights heading off to war to the precedence of pure dance over narrative sense, Raymonda presents an enchanting land with two likeable lovers. The moments, not the whole, made it a fascinating curio. In the Bolshoi Ballet’s production, the Eastern longing of Glazunov’s music was luminously embodied through the entire company. Dance on film could never replace live performance, but it could still be a gateway to other worlds, where a 2-hour medieval love story passed in the blink of an eye. Raymonda would be worth at least one viewing from both those well acquainted with ballet’s tradition and those curious passers-by, especially when SIFFFilmCentergives such easy access to this international broadcast.